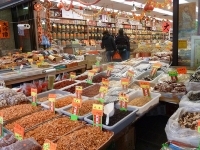 Vancouver's Chinatown is not only a strong, established ethnic community, but also a popular tourist attraction and prosperous commercial district. Its bustling streets are full of colour and commerce; even the pagoda-topped telephone booths add to the atmosphere. Shop displays spill onto the pavements, and tables groan with the weight of exotic foodstuffs and the strange wares of the Chinese apothecaries. The Sam Kee Building in Pender Street is listed in the Guinness Book of World Records as being the narrowest building in the world, at only six-foot (two metres) wide. This was the result of a local property owner reacting to the expropriation of most of his land in 1912 for the widening of the street: Chang Toy decided to build what he could on the remaining tiny strip. Another main attraction in Chinatown is the Dr Sun Yat-Sen Classical Chinese Garden, enclosed behind high walls, that was built in 1986 at a cost of C$5.3 million with the craftsmen and materials all imported from China. It is a quiet haven of walkways, pavilions, gnarled trees, water features, and natural rock sculptures. Next door to the Garden is the Chinese Cultural Centre with its elaborate gated entrance hand-painted in traditional colours.